The elated villagers of Dahlahabi village in Khagrabari under Bhergaon subdivision in Udalguri have organized a prayer meeting for archer Promila Daimaryon Tuesday. The meeting was held in a local Bathou temple in Khagrabari. Thousands of people from the nook and corner of Udalguri including activists of All Bodo Students Union(ABSU),Panery MLA, Kamali Basumatari, Kalaigaon MLA, Maheswar Baro; Bhergaon SDO(C) Dithakananda Hazarika among the crowd of villagers prayed for the ace archer. Daimary is participating in the Asian Games which is underway in Jakarta, Indonesia from August 18. 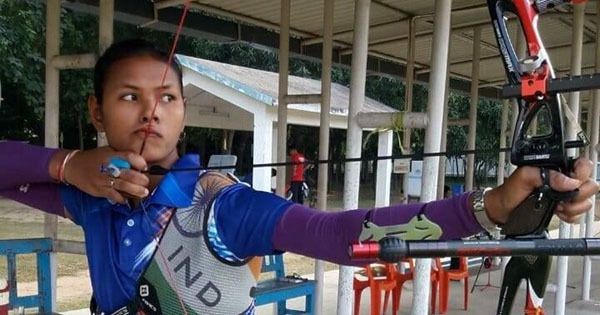 It is pertinent here to mention that India finished seventh in the ranking round of the women’s recurve archery event at the 18th Asian Games here on Tuesday. The second best performer for India was Promila, who scored 642, which includes 19 10s and three Xs to be 21st.